Our 19’ Tunnel Hull Boat is ideal for flyfishing and takes us where we need to go comfortably. 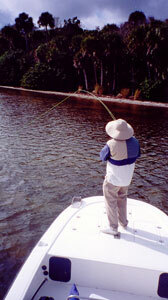 The deck is clean and open allowing for productive flyfishing. Capt. Karty will find the fish for you and give you the approach you need to deliver. 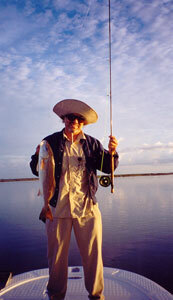 You will be offered use of various flies that are productive with Seatrout and Redfish in Mosquito Lagoon. The ideal place to learn fly-casting is not in a boat. Spend some time in a grassy area, honing your casting skills. Some of our fly anglers get so frustrated within the first fifteen minutes of fishing that they hang it up and grab a spinning setup. Fly fishing for Reds in Mosquito Lagoon isn’t easy, isn’t always productive by any means, and it isn’t for every angler. 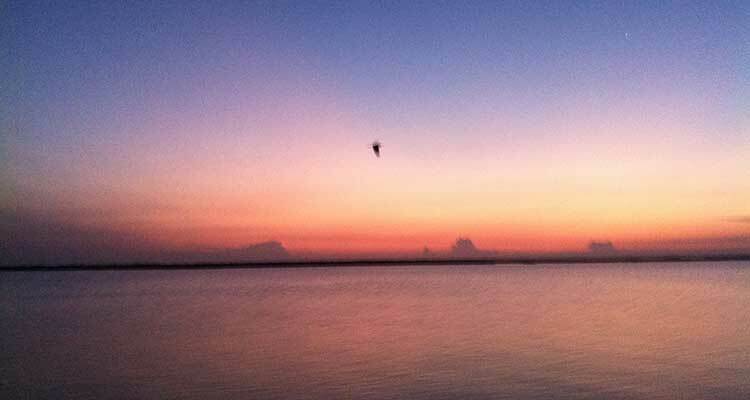 To successfully flyfish in the flats for Redfish and Seatrout, you need to be able to doublehaul. However, many casts may be short and near the boat. You need an 8 or 9 wt. setup with floating weight forward flyline. I had a great time, nothing like flyfishing to Reds. I have fished with dozens of guides over the years and you, Capt. Karty, are the best and most enjoyable I’ve had. You took my casting shortcomings in stride and put me on some great schools of fish. You can bet I’ll be back, can’t wait.